Walking socks are always a cornerstone of successful hiking and trekking tours. An extensive tour puts a lot of strain on your feet. Hiking socks should make comfortable, fatigue-free excursions possible. No trail is too long and no mountain is too steep for high-quality walking socks! Put on a backpack, secure footwear, and good hiking socks. You don't need more than that to go on a hiking adventure! What should good walking socks do? Walking socks need a few important properties to keep your hiking tour from becoming torture. A general problem for long trips on foot is blistering. High-quality hiking socks have an optimal fit. This avoids needless abrasion in your walking shoe, a risk that should be controlled. They should also be quite durable. You'll often end up wearing them on far-reaching trails. Many hiking and walking socks are reinforced in high-impact places such as the heel. This lengthens their product life to some extent. 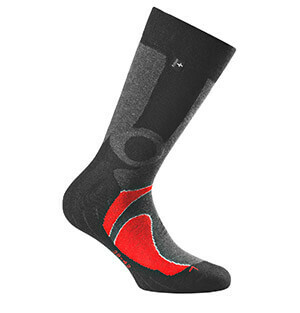 Merino socks create a good foot climate. These Merino wool walking socks are breathable and fit very well on the skin. The best part of all is that their anti-microbial properties make them odor-resistant. Smelly feet don't even stand a chance!